Blessing with faith leaders at St. John the Evangelist Cathedral, 127 E 12th Avenue. and oil export proposals. The journey began in the Dakotas, and will end at the Beaver Lake Cree Nation in Alberta Canada, raising awareness at threatened communities along the way. Over 200 attendees sat and stood on the lawn on a sunny day underneath the shade of large old trees, and quietly listened for over an hour and a half to a humbling group of speakers. Rev. Martin Elfert welcomed the journey to the cathedral. 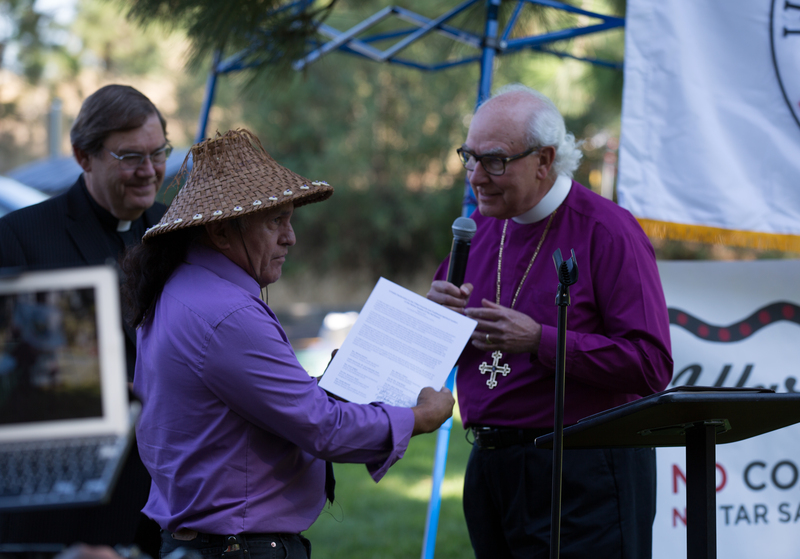 Then Bishops Wells and Waggoner of Evangelical Church of America and Episcopal Diocese of Spokane, respectively, offered a letter of support to the Lummi based on promises made in 1987 and 1997 letters of apology to indigenous peoples of the Northwest. A Lummi dance rattle was gifted back to Jewell James, head carver of the House of Tears Carvers. Spokane City Council President, Ben Stuckart, offered strong words of support in opposition of proposed coal and oil projects. Carol Evans, Vice-Chair of the Spokane Tribal Council, Albert Redstar of the Nez Perce Nation, Joe Pakootas of the Colville Tribe, and other tribal members spoke in support of the Lummi. Then Jewell James led a moving series of speaking, flute playing, drumming, and laughing to explain the importance of the fight against fossil fuels and for the earth along with other members of the House of Tears Carvers. The totem pole, an ancient story telling medium, showed the hard fight against fossil fuels, a call to action to “warrior up”, and the hope of future generations. After a quick call to action to sign a petition and support the journey financially from local organizers of the Sierra Club and Earth Ministry, Bishop Waggoner offered a prayer and blessing for the totem pole and sent the journey on its way. Attendees were also able to participate with a mural painting project that is traveling with the totem pole that will tell the story of the journey.